Control knobs aren’t especially convenient for using volume-based effects like swells and decays. But the best volume pedal options will do this and more. Built-in boost and no frequency loss make it excellent for guitarists. Volume leaks are the most common complaint. The compact design takes up less space on your pedal board. Less precise controls than some of the larger pedals. Straightforward and affordable choice for keyboards, synthesizers, and effects. The exterior design isn’t up to par with more expensive options. Wide range of volume control with a consistently smooth taper. Doesn’t have a tuner or expression output. 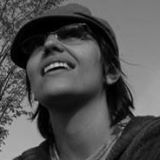 Jessica Simms is a saxophonist and life-long student of music. 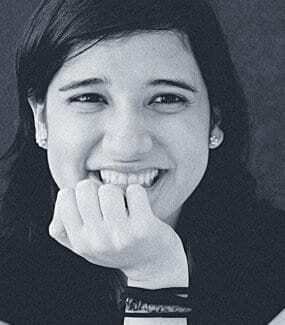 She works as a freelance writer and ghostwriter in Pittsburgh, PA. Passive or active isn’t always a completely cut and dry question. In some cases, a pedal may be able to perform basic functions without an outside power source but will require one for more advanced features. The pedal may give you very pleasant swells when it’s not plugged in, for example, but won’t be responsive to changes to the minimum volume knob. This kind of dual functionality can make the pedal more adaptive to a variety of different situations. As is the case with many effects pedals, there is a lot of variety in the volume pedal market. They can range in price from less than fifty bucks to a few hundred dollars, and often perform far more advanced functions than simply giving you more in-depth control over your dynamics. 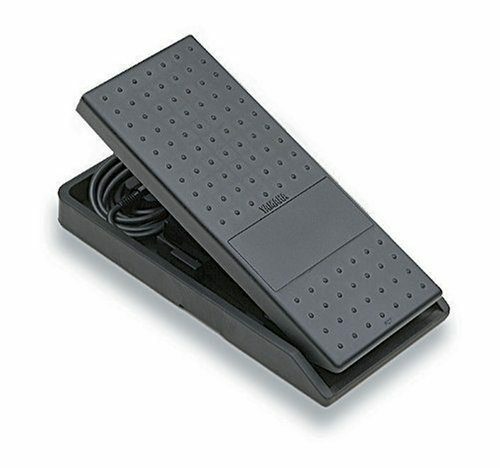 Those who don’t play guitar or bass may wonder what the point of a volume pedal is. 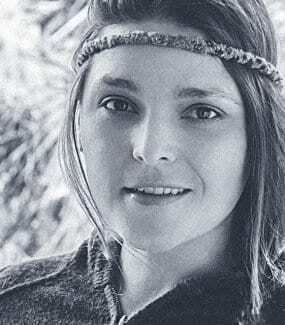 After all, there are volume control knobs on your amp and instrument; a separate piece of equipment that does the same thing might seem a bit redundant. Those control knobs aren’t especially convenient for using volume-based effects like swells and decays, however. 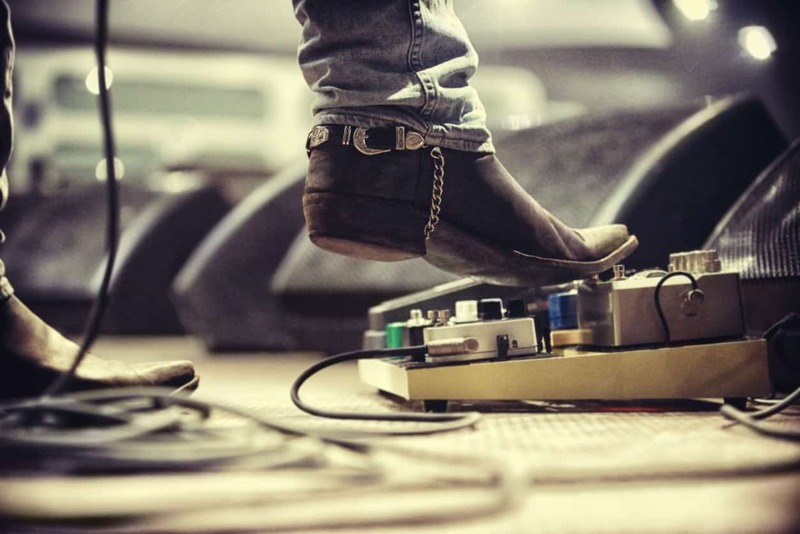 The best volume pedal options will often do this and more. The pedals on the list below are what we came up with after considering all of the factors above. All in all, they’re some of the most versatile, most durable, and overall most useful volume pedals on the current market. If you want to add this incredibly useful effect to your arsenal, one of the choices below will give you exactly what you’re looking for. All eight of these pedals will give you good volume control, and most of them use a very similar interior circuitry to get the job done. The exception is the Lehle Mono Volume Pedal, which is both the most unique and the most expensive option on the list. The main difference between the others comes down to the material of the casing, the size of the pedal, and what they can do beyond simple volume control. The idea behind all of these pedals is the same: to give you a way to do fades and otherwise adjust your instrument’s volume without having to mess with the knobs directly on your instrument or amp. Given how simple the concept is, you might be surprised by just how many factors there are to consider when you’re buying a volume pedal. Obviously, the first thing you’re looking for is quality. The pedal needs to work with your equipment and deliver a smooth swell and fade or nothing else about it really matters. Not every pedal will go completely to mute, so you’ll need to pay attention to that feature if you need the option of making your instrument completely silent. All of the options listed here have an excellent effect range and responsive pedal. When you’re choosing between products that are all of a similar high quality, you’ll be making your decision based on more specific qualities. Consider the different characteristics below. Not all of them will be important to every player, but looking through some of your options can help you narrow down which one you want. Is passive or active equipment best? There are two sides to this question: whether the pedal itself requires an external power source, and whether you’ll be connecting to passive or active pickups. Let’s start with the first part of that question. Some pedals will require an external power source, and some of them won’t. There’s no difference in sound or performance between these pedals; the only difference is how they operate. Volume pedals don’t tend to be battery hogs as much as other effects, but you will need to have a supply of 9-volts on hand if you go with a battery-operated version. You can also find powered pedals that run on an adapter. These will save you on batteries but will mean you’ll need to track down an outlet. A powered pedal is especially convenient if you have a lot of pedals on your board. Individual 9-volt batteries aren’t expensive but the costs can add up if you have a lot of pedals. The same thing goes for outlets—the spots can fill up quickly between your amp, pedals, cabinets, and other equipment. You can always buy a space-saving adapter with multiple plugs to help everything fit, but not having to worry about it is even better. The second part of that equation is whether you’ll be using the pedal with a passive or active pickup. Some pedals will work with both, but for others, you’ll need to buy different versions to accommodate different power levels. This has to do with the number of channels the pedal can process. If you’re using the volume pedal as an effect for a guitar or bass, a mono pedal will work fine for you. If you’re using it with a synthesizer, keyboard, or another instrument with multiple voices, something like the Yamaha FC7 will be better for your purposes. As a side note, you want to consider the number and type of outputs the pedal has. You’ll find up to three outputs on the pedals on this list. These can give you the option of sending the signal to more devices and is an especially good choice if you want to use it as an expression pedal. There are two major categories of interior circuitry. Most pedals use potentiometers, or pots, to drive them. This is a kind of resistor that passes the signal from your guitar through the pedal and to the next piece of electronics in the chain. Pots are inexpensive to make and use, which is why they’re so common. They do wear out over time, however. You’ll be able to tell that a pot is wearing out because the sound will suffer. It may get scratchy, or you may start hearing extra signal noise that wasn’t there before. If the pots get worn out, they can be replaced. Whether or not this is worth it, though, will depend on a lot of factors, including how much you paid for the pedal in the first place and how much of a hassle and expense it will be to find replacements. Pedals with pots aren’t your only option. You can also find pedals that use electro-optical circuitry, Like the Morley Little Alligator on this list. In an electro-optical circuit, there aren’t as many moving parts. Optical technology is used to read the position of the pedal and use that information to alter the signal. This means less wear and tear on the interior circuitry and a longer life for your pedal. While pots will wear out over time, they do tend to last for quite a while before they do so if the pedal is well-made. You can expect most of the pedals on this list to keep sounding great even after years of daily use. If you want that extra assurance that your pedal will last for a long time, though, electro-optical circuitry is a great choice. Different effects will work better for different instruments and situations. What you play should play a factor in your choice when you’re looking for a volume pedal. We’ve already talked a bit above about what you need for a keyboard or synthesizer, but even between different types of string instruments, you’ll find certain pedals work better than others. The chart below will give you some basic suggestions of what you want to look for in a volume pedal for a variety of instruments. While there’s certainly no hard and fast rules, it’s a good guide to help you get started. 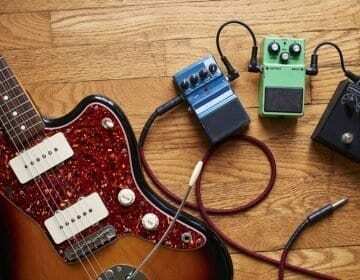 Even two guitarists might prefer different pedals depending on the kind of music that they play. A jazz’s player’s conception of the ideal tone isn’t likely to be the same kind of sound a heavy metal player is going for. Generally speaking, players in heavier genres will take more interest in boost features that will give you a bigger, badder overdrive. Folk or jazz players are probably going to be using the pedal more for switching from rhythm to solo modes and won’t get as much use out of some of those more advanced features. Check out the chart below for more details on what to look for if you play different genres. Few professional guitarists play in just one style, even if they have one that they play most often. If you do a lot of switching between styles, versatility is likely to be one of your main considerations. The more transparent a pedal is, the better it will adapt to a lot of different playing styles. Think all that matters are the pedal functions? 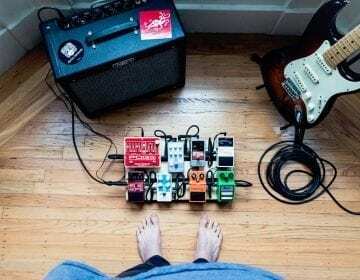 Aside from the inherent differences between pedals on the inside, there are some other factors that will likely play into your decision about which one you want to buy—some of which don’t have anything to do with how the pedal functions. While sound and performance would be the only considerations in an ideal situation, in the real world the factors below can be just as important. If you use a lot of pedals, adding another monster to your board for a basic function like volume might not be so appealing, no matter how necessary the effect is. The good news is, you can find some pretty compact little pedals out there that give you the same bold swells as models that are twice the size. You want to know you can count on your pedal to perform the same way night after night. Pedals can take a lot of abuse when you’re taking them to and from gigs—not to mention the kind of beating they take during the show. If you want your pedal to last for years no matter what you do to it, the construction quality should be one of your top concerns. A volume pedal can be an important tool in your arsenal, but that doesn’t mean you have to spend a lot of money to get one. If you’re on a budget, you can find quite a few excellent volume pedals that won’t set you back too much. The main sacrifice you’ll likely make is in the casing material; pedals in the $50 and under category are more likely to be made of plastic. Most volume pedals won’t increase your volume past the maximum setting on your equipment. If you want to be able to push your gain, look for a pedal with a boost feature. These will give you a little bit of extra oomph along with smooth swells. The ability to adjust the angle and height of the pedal is a feature you won’t find on all models. It’s especially important if you play both sitting down and standing up so that it can be comfortable to use in every situation. A smaller pedal is great if you’re short on space, but you should also think about how it feels when you’re playing it. Smaller pedals can sometimes be harder to get an accurate response from, and often don’t put up as much resistance as larger versions. The Best Volume Pedals On The Market. Period. The Most Valuable Pedal from Ernie Ball is aptly named. Its versatility and smooth operation make it one of the top choices for music pros of all stripes. Let’s start with the basics. This pedal is so sturdy it’s practically impossible to break—and while that’s not a challenge, you’d probably be fine even if you took it that way. The casing on this bad boy is aircraft-grade aluminum, an even sturdier material than what’s used in many metal pedals. The response on this pedal is also fantastic. It has a smooth operation that allows for a lot of nuance with your tone shaping. The minimum volume can be adjusted using the knob on the back, giving you even more control and letting you make more precise adjustments. The settings start at 50% so you have a wide adjustment range to work with. The MVP also had a feature we didn’t see on other volume pedals too often: a gain control. It can boost your sound as much as 20 decibels, pushing it into overdrive. If you’re in need of more power but don’t want to upgrade your amp, this is a viable alternative. This is a mono pedal, so it’s not the best option for keyboardists or synth players. It’s perfect for guitarists, however, especially since there’s absolutely zero frequency loss, even at extreme high range and volume levels. It will work with equipment of any impedance, so you can use it no matter what kind of pickups you’ve got on your instrument. There’s even a dedicated tuner output so you can tune up mid-gig without the whole venue listening in. 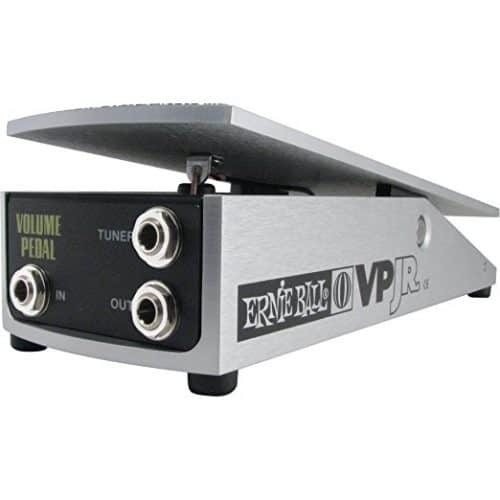 If you like the Ernie Ball MVP above but you need something a bit smaller, check out the VP Jr., which gives you the same style of volume control in a more compact package. It doesn’t have all the features of the full-sized MVP but the build and tone quality is just as high—and it costs about $50 less. The VP Jr. comes in two flavors: one with 250k ohms of resistance for passive pickups and one with 25k ohms of resistance for active pickups. Aside from the impedance, the two models are identical. Like the Ernie Ball MVP, they’re designed for use with mono instruments like guitars and basses rather than stereo instruments like keyboards. Like the MVP, the VP Jr. has a casing made of aircraft-grade aluminum. Ernie Ball is a company that understands guitarists. They’ve put a coating on the top that makes it impervious to spills, so you don’t have to worry if you’re using it in a cramped club. This is a pedal that’s built to last, inside and out. This pedal doesn’t feel delicate, either, despite its small size. The pedal gives a nice amount of resistance when you step on it, which translates to better control and smoother fades. The VP Jr. uses a taper switch instead of an adjustment knob to control the volume level. This doesn’t give you quite the same smooth taper but it does give you two different swell rates, useful for changing between foreground and background. There aren’t a lot of bells and whistles on the VP Jr., but simplicity can be a very good thing. If you’re looking for a compact, road-worthy volume pedal, this one delivers. It gives you a broad and smooth volume sweep without any loss of your tone—the most important quality in any volume pedal. The FC7 from Yamaha is the most affordable option on this list. It’s designed for use with Yamaha electric keyboards but will function just as well with anything that uses a ¼” jack output for the pedal, including synthesizers, mixers, and other recording or DJ equipment. 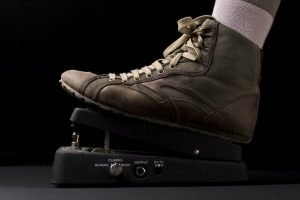 You can even use it with intelligent lighting or drum machines—anything that has an attribute you want to assign to a footswitch. In addition to the standard controls, this pedal also has the Fortissimo Function. This lets you add a bit of extra accent to specific sections to make them stand out. This can be especially handy for synth players and DJs. As you might expect from a pedal in this price range, the FC7 is made of plastic. This doesn’t mean it’s flimsy, though. The hard plastic used for the exterior is thick and resists cracking, and the connection plate, spring, and other interior components are made of high-quality materials that are built to last. The only complaint most players have about the design is that the top of the pedal is textured but not coated, meaning it’s more likely your foot will slip off while you’re playing. Despite its small flaws, the FC7 is very playable, and it certainly doesn’t feel like a budget model. You can adjust the angle of the pedal for maximum comfort while you’re playing, for example. Small details like that let you know you’re using a pedal designed by music instrument experts with the musician’s experience in mind. Note: If you plug the volume pedal into your instrument and it seems to work backwards, this doesn’t mean the pedal is broken. It simply means that the keyboard’s adapter reversed the polarity. Unplug the pedal, then unplug your keyboard’s adapter. When you plug things back in, plug the pedal in first, then turn your instrument on. Things should be working better. This is one of the more distinctive-looking pedals that you’ll find. The slightly strange design isn’t just for aesthetics, though. The extra distance between the base and the pedal gives you a wider viable range of effect control. The clean simplicity of the pedal makes it very easy to use, too. The minimum volume knob is at the bottom of the pedal, out of the way of your foot, and there’s an easy-to-read LED indicator light so you can tell when it’s powered on. The interior circuitry of the Little Alligator, meanwhile, makes sure that the taper is smooth and consistent throughout, with none of the jumps some other pedals suffer from. It’s entirely electro-optical so you won’t have to worry about any signal noise. This also makes the effect more dependable, so you don’t have to worry about the pedal wearing out from regular use. The only thing this pedal is lacking is a secondary output for a tuner—not necessarily a deal breaker, but an odd omission gave the strength of the pedal in other areas. It does have an external minimum volume control that makes it easy to switch from rhythm to lead and gives you a wider viable effect range. Sound-wise, the Little Alligator is wonderfully transparent at all dynamic levels. It’s perfect for a reliable clean boost of your tone. This transparency also makes it extremely versatile. You can use this in any style or genre, and it will function just as well with either guitar or bass. 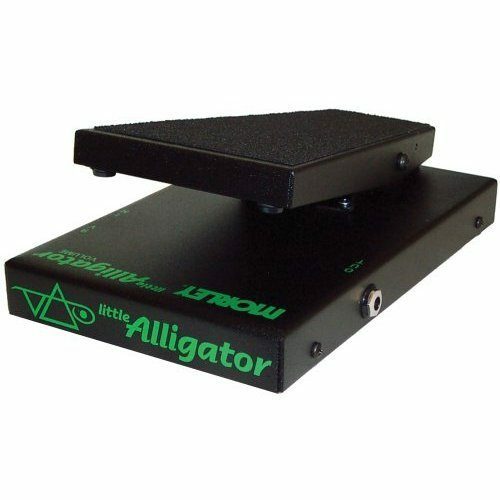 If you use other effects pedals, as well, you can put the Little Alligator anywhere in the signal chain without impacting the sound of anything that comes before or after it. You can’t always count on products that bear a famous name to be any better than the rest. In this case, though, Steve Vai didn’t just put his name on this pedal. 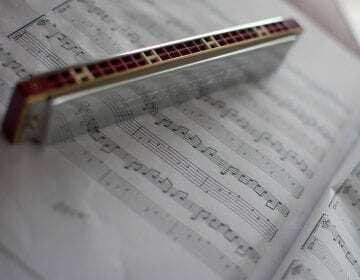 It was designed to his settings and specifications so you know it’s designed with a professional guitarist in mind. Buying a pedal that costs less than fifty bucks can sometimes be a gamble, even with a relatively simple device like a volume pedal. With this EP-2 from Valeton, though, you not only get a reliable volume pedal but also an expression pedal in the same device, and all of this for an easily affordable price. Unlike many 2-in-1 volume/expression pedals, there is only a single jack each for the input and output on this pedal. The internal circuitry detects the output source automatically and makes changes accordingly, allowing them to simplify the overall design. 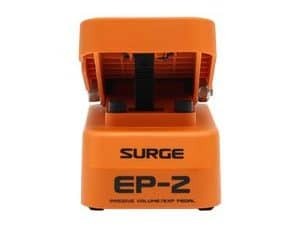 The EP-2 comes from Valeton’s Surge series, which are designed to combine volume pedal control with other popular effects. 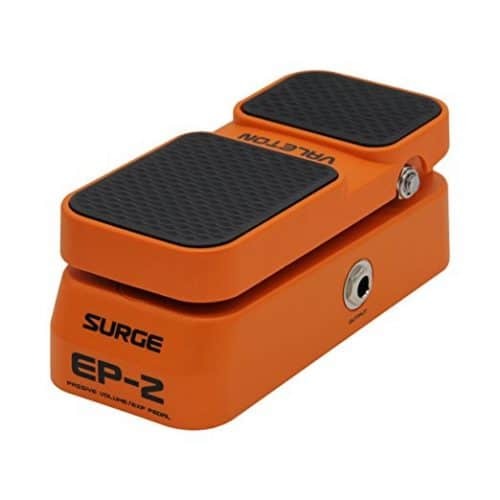 This alone has the potential to save you space on your pedal board, but the EP-2 itself is also very compact, basically giving you two pedals with less of a footprint than you’d normally need for one. While this is the cheapest guitar/bass volume pedal on this list, it is also the only one of the type that’s constructed out of plastic. This does make the pedal much lighter in weight than its metal counterparts but also means it’s more susceptible to cracking or breaking. The plastic that’s used is hard and durable so this won’t be a problem for most users, but if you know you have a particularly heavy foot or tend to be rough on your equipment, you may want to look elsewhere. You can use this pedal with a lot of different instruments, including familiar choices like guitar and bass but also things like electronic drum sets. The only thing to keep in mind is that it’s designed for use with passive equipment, so it won’t work with any instrument that uses active pickups. It’s also not the best choice for keyboards or synthesizers; the output has a stereo option, but the input is mono. Least expensive guitar/bass expression pedal on this list. Not as sturdy or versatile as other volume pedals. 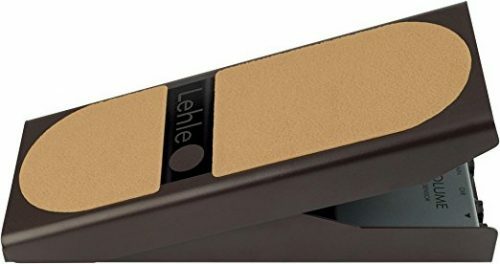 If you’re looking for the ultimate tool for instrumental volume control, the Lehle Mono Volume Pedal is the one you want. Rather than using traditional electronics, it operates with a magnetic Hall sensor. When you press the pedal, only the magnet moves. This limited interior motion means that the pedal won’t wear out even after extended daily use. There also aren’t any mechanical pots inside the Lehle Mono pedal. In lieu of these typical components, you’ll find a Blackmer Voltage Controlled Amplifier (called a VCA for short). The VCA reads the information conveyed by the Hall sensor and responds accordingly. Not only does the VCA give the pedal more precision, it also eliminates the pesky signal noise that you can sometimes get with electronic circuitry. There is no frequency loss when you use the Lehle Mono pedal. You’ll get a true sound and response throughout your instrument’s range, again correcting one of the common complaints against traditional volume pedals, which tend to have a muffling effect on the extreme high frequencies. You’ll also get a boost function when you use this pedal, increasing the gain by up to 10 decibels. The volume control goes from -92dB to 0dB and gives you a smooth and consistent taper throughout that range. The auxiliary output is buffered, making it ideal for either a tuner or a secondary amp. The exterior design of this pedal is more straightforward. All of the connections and controls are on the back of the pedal, including a dial for adjusting the gain. The overall construction of the casing is solid and consistent. Lehle pedals, in general, are considered to be practically unbreakable, and this model is no exception to this rule. No matter how rough you tend to be on your equipment, this little guy can take it. When it comes down to it, the Lehle Mono pedal gives you exceptional power and precision compared to more traditional volume pedal designs. Whether or not this is worth the extra money you’ll have to spend to get it really depends on your playing style and performance needs. Unique electronics make it consistent, durable, and versatile. Much higher price point than other options. This pedal is based on the Boss FV-300, a pedal that has served as the industry standard for over a decade. This is the high-impedance, mono version of the pedal, designed for guitarists or bassists with passive pickups installed on their instruments (if you’re looking for a volume pedal for a keyboard, you’ll want their low-impedance stereo version, the FV-500L). The build is what you’ll find most appealing about this pedal. 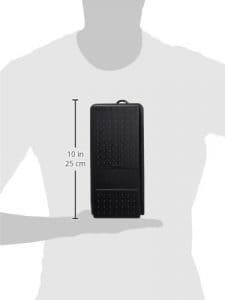 The aluminum die-cast case is far more rugged and road-worthy than plastic options. The pedal mechanism has an incredibly smooth action, too, which makes it both more comfortable to use and easier to control. The drag control on the side of the pedal lets you alter the amount of resistance to suit your style. The top of the pedal has a rubber coating so your foot won’t slip off while you’re playing. These practical concerns aside, it’s also a very attractive pedal, with a sleek, modern look. The FV-500L is also a very versatile pedal. It has an expression output, meaning it can be used with any expression-compatible equipment you may have in your arsenal. It can be used as both a volume and an expression pedal at the same time, even—a handy feature for gigging professionals. It also gives you more output options than most volume pedals, with one each for the main signal and the expression as well as a dedicated tuner output. One reason the FV-500L is a contender is that it will only impact your sound when you want it to. There’s no power switch, which means it won’t make any extraneous clicks or noises when you’re using it. Since it has no impact on your tone, you don’t have to worry about where you put it in your effects chain. The Boss FV-500L isn’t the cheapest volume pedal out there, but it’s comparable in price to other similar designs and its full range of features makes it well worth the money for gigging professionals. You’ll get the build quality and consistency that you expect from Boss in an easy to use and versatile pedal. 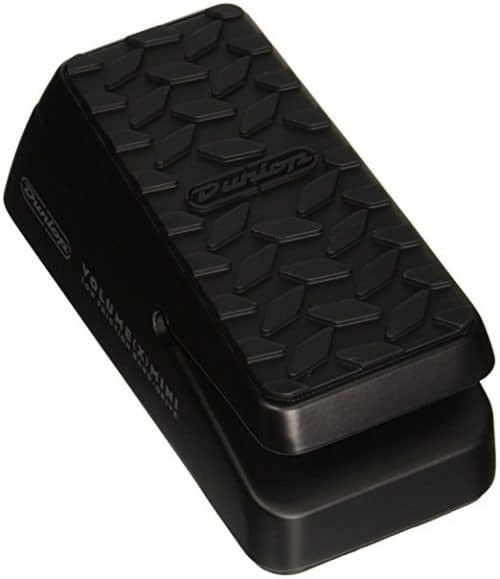 The X Mini from Dunlop just might be the smallest volume pedal you’ll find anywhere. At just over a pound and only six inches long, its super-compact design means it can fit in any set-up and is incredibly easy to transport and store. This isn’t just a volume pedal, either. 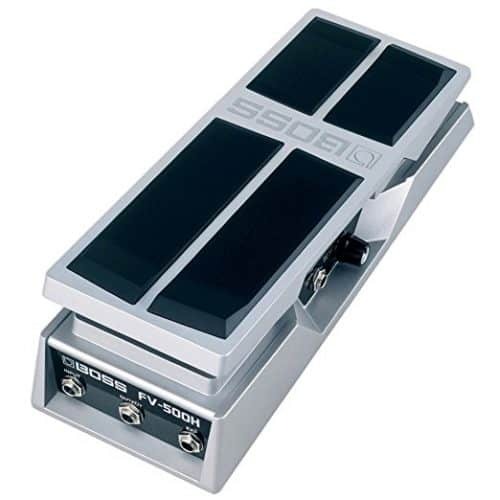 It can also function as an expression pedal, with an auxiliary output for plugging in effects. 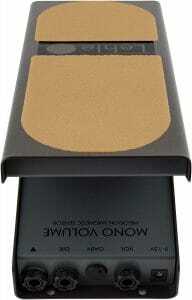 It has an internal pot that you can use to adjust the values, allowing it to work with a wider range of effects. You can also switch the heel and toe positions, a more logical position for some effects. This secondary input can also be used as a tuner output for silent tuning of your instrument. The pedal action on the X Mini is controlled with a low-friction band drive. It’s this mechanism that allows them to keep the pedal so small. It also gives you a smooth and sensitive response, with an even swell throughout the dynamic range. It doesn’t have quite as wide of a functional range as some larger pedals, which is also in many respects a factor of the small size; there’s simply not enough space for the pedal to move as far. Within the range it does have, though, it instantly reacts to changes in your foot pressure. Dunlop pedals are known for their solid, smart build. This particular little pedal uses an aluminum chassis that protects the internal components from damage, even from most impacts and drops. The top also has a substantial rubberized tread that holds your foot in place while you’re using it. You can adjust the rocker tension, too, if you want it to be more sensitive or offer more resistance. The small size of the DVP4 does limit the amount of external space available for the knobs or toggles on other volume pedals, which does give this pedal a slightly smaller effective range. If you’re looking for the best volume pedal ounce for ounce, though, this compact wonder is a strong candidate. 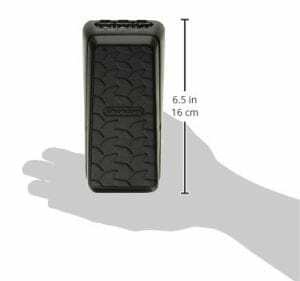 One of the most compact volume pedal options. The volume control is more limited and less consistent than other similarly-priced pedals. The majority of the pedals above are aimed at guitarists, bassists, and other mono instruments. If you need a stereo option, the Yamaha FC7 is a good one to go with. It’s especially appealing since it’s the most affordable of the choices we’ve picked out on the list. 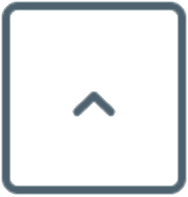 This isn’t just coincidence; the demands placed on a volume pedal for a keyboard are typically less than those placed on volume pedals used by guitarists and bassists. The pedals intended for use on keyboards are usually priced lower accordingly. As we said before, the choice between these pedals really comes down to your needs as a player. When it comes to high-quality pedals made by reputable manufacturers, like all of the options on this list, the differences in price are going to be more related to the details and features of the pedal than they are a measure of quality. This is perhaps best demonstrated by the two Ernie Ball pedals that top the list. They’re almost identical in terms of the interior circuitry and overall sound. The difference in price is mostly because of the smaller build and reduced features on the VP Jr. compared to the MVP. You can use the buyer’s guide and the reviews above to get you started on the right path, but a lot of choosing the right pedal is going to come down to its sound and its feel. Everyone’s taste and style are a little bit different, and the best option for one player may not be the right choice for another. That being said, we still see some standouts in the field we reviewed today. 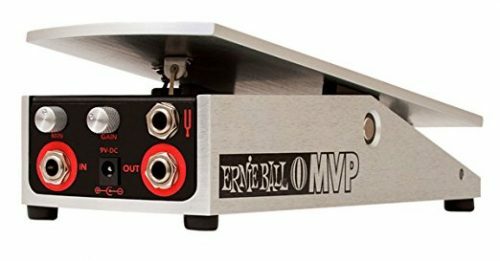 In terms of overall performance, the Ernie Ball MVP is the best volume pedal for the majority of users. It’s versatile and consistent, and while it’s far from the cheapest option on the list, the combination of features and quality nonetheless make it an excellent value. The FC7 from Yamaha is the cheapest priced option we included in our reviews. That being said, it doesn’t skimp on options. It’s ¼” jack means you can use it on all kinds of instruments, making it a versatile choice that’s hard to deny. There are a lot of great volume pedals out there, but the eight listed above are a great place to begin your search. Whatever instrument or genre you play, a volume pedal can help you to bring more dynamic sensitivity and nuance to your sound and is a fantastic way to take your sound to the next level. 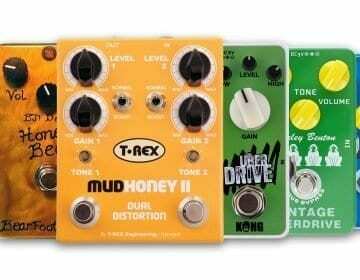 That being said, all of these pedals are attractive options, and your particular best pedal might be different. If you’ve had a good experience with a different pedal, make sure to drop us a line in the comments—even if it’s not one of the ones from our initial list. Do I have to buy anything to power these? That depends on the pedal. If you buy a passive pedal, then you won’t need to worry about powering them at all. Simply plug them into your signal chain and they’ll start working without any extra electricity being supplied. If you don’t see anything specified about power in the list above, you can assume you don’t need any extra power supply to run the pedal. If you buy a powered pedal, you should assume they don’t come with the power cord or batteries unless the posting specifically says otherwise. That leads to the question of what you should buy so you can use them. Double check whether it uses an outlet or a battery. You can get power adapters designed specifically for pedals on Amazon for less than ten bucks each. How do you mute the sound completely with a volume pedal? Most volume pedals can be muted by pressing down on the heel rather than with the toe. You may also need to turn the minimum volume knob completely down. On models that have a tuner output, the signal will also be silenced when you use it, allowing you to tune without playing it to the crowd. 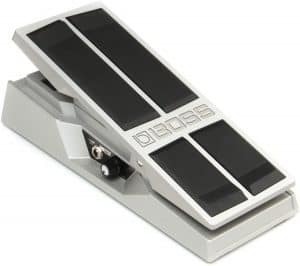 What is an expression pedal? How is it different from a volume pedal? Expression pedals are common controls that you’ll find on keyboard instruments, like organs and pianos. They let you control the attack, sustain, and decay of your notes. 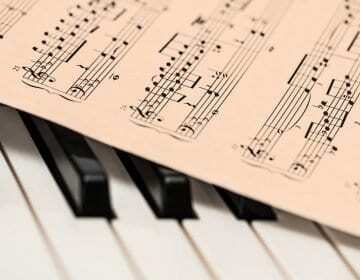 On electronic instruments, they can also be used to control the speed and range of effects like delay and reverb. Many volume pedals are also expression pedals, and in many cases, you can use them interchangeably. Pedals that are designed specifically as expression pedals will typically have more internal controls for customizing the effects. What is a true bypass? Is it important on a volume pedal? Effects pedals that have a true bypass mean that your signal is completely unaffected when the pedal isn’t in use. This means that there’s no buffering applied, and no loss of tone. Generally speaking, however, volume pedals have very little impact on your tone, even when they’re active. They simply determine the amount of the output and not the way it sounds. This makes a true bypass less necessary than with other pedals that may have a more significant impact on how your instrument sounds. Will these pedals work for acoustic instruments? As long as you have a pick-up on your instrument, you can hook it up to a volume pedal. This means these pedals can work just as well with a mandolin, ukulele, acoustic guitar, or any similar instrument. You will want to look for a pedal that has an emphasis on low signal noise to make sure you get a clear signal. Pedals that don’t experience any frequency loss in the higher end will also help make a treble instrument like a mandolin sound its best. My pedal is making a humming sound. Is it defective? There are a few things that can cause extraneous noise from a pedal, and it isn’t always something that you’ll need a repairman to fix. First, make sure that all of the connections are secure. You may also want to open up the pedal and make sure that none of the wires are rubbing each other when you play. If they are, you can secure them using zip ties. If you don’t know enough about electronics to assess or fix these kinds of things yourself, don’t forget about the experts at your local music store. They can check out whatever’s causing your problem, and might even be willing to show you how to fix it in the future if it’s a simple thing. What is impedance? How does it affect an effects pedal? Impedance is a measure of the resistance offered by an electrical circuit in response to an alternating current. It mostly comes into play in how well your equipment works together. Electronics that have a similar impedance will be less likely to cause damage to each other because of imbalances in the amount of current each one can handle. When an effects pedal, like a volume pedal, is described as being “high impedance” or “low impedance,” this is mostly a way of saying what kind of guitar pickups it’s designed to be used with. A high impedance pedal will work best with passive pickups, which tend to also have a similarly high resistance. 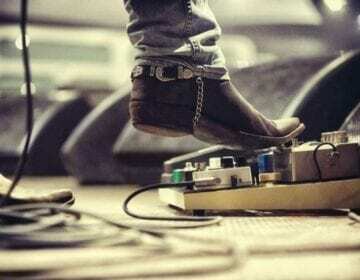 Pedals that are described as “low impedance” have a resistance about a tenth that of a high impedance pedal and are designed for use with active pickups. What else will I need to use this pedal? Aside from the power sources mentioned above, not a whole lot. You will need to have a cable to connect the pedal to your amp or instrument. These typically won’t come included with your pedal, mostly because the majority of guitarists already have plenty of ¼” audio cables on-hand. If you don’t have one, you can find them for less than $5 on Amazon, in a variety of different lengths and connector configurations.